It was effectively the last day of summer with blue skies and warm sunshine and Worplesdon was at its very best with great greens and lush fairways. Shirt sleeves were the order of the day as members enjoyed a great test of golf and this was reflected in the final scoring with no player managing to break par. Even though he claimed he was all over the place with his shot making, circulation’s Chris Underhill’s 36 points was enough to win him the Northcliffe Cup and a case of wine. Unfortunately for his Christmas Scramble team, he was cut two shots to 16 for his win which was one shot clear of Mail Newspaper’s Nick Stevens who was cut one shot for his 35 points. Nick, who is the lowest handicap player with the Society, will be playing at the final fixture of the year at The Berkshire off his new handicap of three. In third place with 33 points was Daily Mail executive Neil Darbyshire whose 33 points just beat the colour studio’s Barry Theobald on count back and in fifth place was Hamsworth Printing’s Peter Murphy with 32pts. 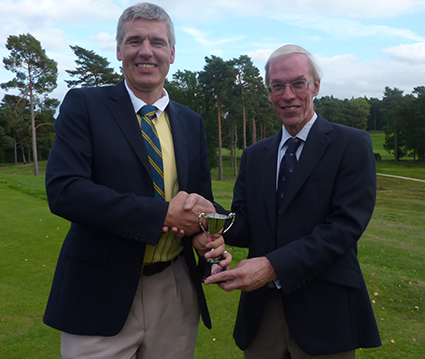 This placing for Peter proved to be good enough for him to qualify for the top four in the Order of Merit for the Golfer of the Year competition and he will join Mike Wall from Evenbase, Nick Stevens and Society secretary Garth Burden in the play-off at Frilford Heath. Trophy winner Chris Underhill backed himself in the fund raising Back the Winner competition, even though when he signed up he didn’t think he would be good enough to win, and with no one else selecting him he collected £100. Even though the Par Three holes were long and hard, there were three players who scored two’s on their card with Daily Mail executive Stephen Wright, Neil Darbyshire and Nigel d’Cruze all winning £10 each. The prizes were presented by the Society’s Vice-President Peter Williams.